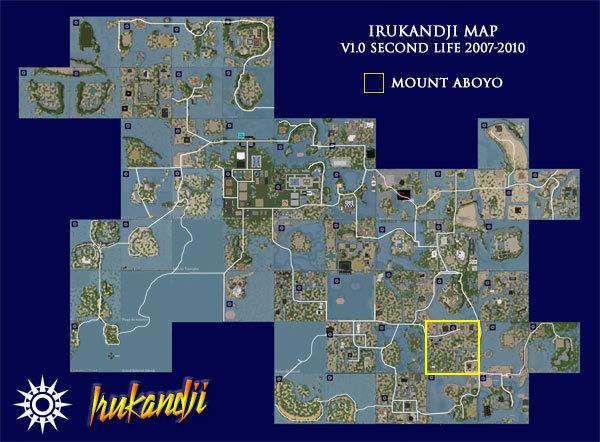 NOTE: This page is about Mount Aboyo Island in Second Life. 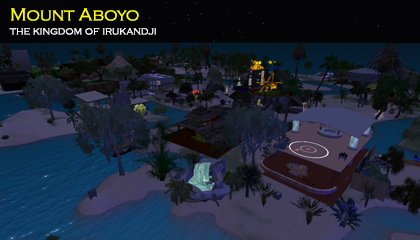 The InWorldz version is here: Mount Aboyo in InWorldz. Mount Aboyo Island is a region in Aboyo State in southeast Irukandji. Mount Aboyo Island is one of three simulators I commissioned simultaneously, following the rapid uptake of land on Pinjarra Island. The three new sims, directly southeast of the nation's capital, Tamita Island, were Mount Aboyo Island, Cabria Island, and Tora Tora Passage. Together, they formed an L-shaped landmass that wrapped around Minoan Atolls. Mount Aboyo Island was the first of the three that I subdivided. It featured flat blocks and winding canals like previous residentail islands, however the layout was deliberately haphazard as I was growing bored with creating the same type of region over and over again. Instead of one river, Mount Aboyo Island had two. The Aboyo River flowed through the island's southeast from Tasman Sea, and the Maskari River entered through Tiamo Reef and Minoan Atolls. Mid island, the two waterways converged. And instead of square angled parcels of land, many had diagonal edges in order to follow the rivers' banks. There was even a triangular mini island in the middle of the Maskari. The landscape was really quite remarkable. The uptake of land on Mount Aboyo Island was fast, though perhaps not as fast as the more conventional sims which offered nice square blocks to build on. Mount Aboyo Island was a good learning experience for me, as it taught me what the vast majority of people wanted when they were looking to buy land. That didn't scare me though - I stuck with the rambling odd-shaped blocks, and soon enough, the island filled with a certain niche of people who wanted something less ordinary. Mount Aboyo Island certainly was that. Eventually, two major landowners used their ingenuity to build considerable homesteads on Mount Aboyo Island that overflowing into the neighbouring sims of Cabria Island and Tora Tora Passage (later Toraboyo Beach). The Trans Irukandji Causeway entered the island from multiple regions, making it a significant hub in the kingdom's thirty-one kilometre road network. Other regions not already mentioned that adjoined Mount Aboyo Island were Manatu Island and Old Fort Island.